This Now Boarding review was made after playing the game eight times. We were sent a copy of this game by the publisher in exchange for an honest review. 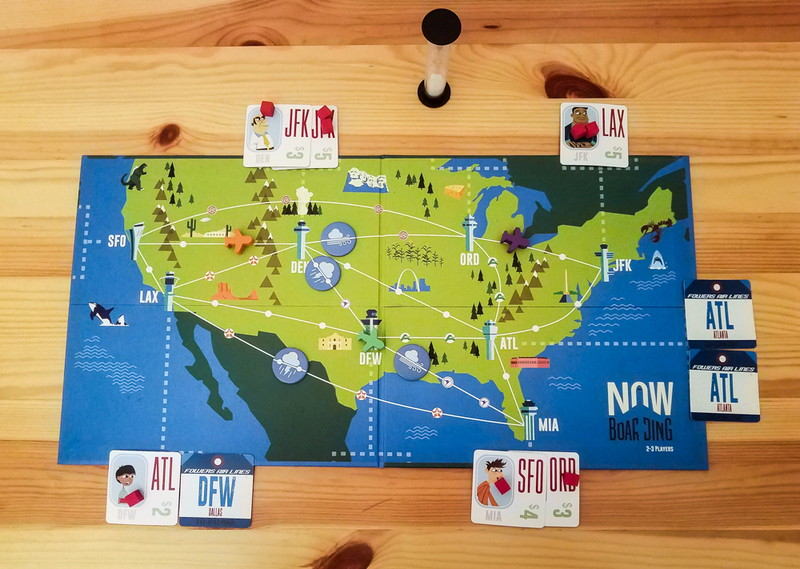 Now Boarding is a real-time pick-up and deliver game in which you are pilots trying to get passengers to their destinations before they become too unhappy. The game was designed by Tim Fowers (Burgle Bros.) and is published by Fowers Games. Now Boarding is played over three stages—Morning, Afternoon, and Night—which cover one day in the lives of 2-5 pilots. The pilots work for the same airline, so it’s in everyone’s best interest to satisfy as many passengers as possible. Each stage of the game consists of multiple rounds. You’ll be adding a set amount of passengers to the board each round based on the number of players, and when a passenger deck is depleted you move on to the next stage. You’ll also add weather tokens to the board at the start of each stage, which can make some routes tougher (storms) or easier (tailwinds) to get through. When you add passenger cards to the board before each round, you’ll place them face-down so you’ll know where those passengers need to be picked up but not where they need to go. You won’t know where they need to go until the sand timer is flipped. This is when the players need to talk about their plans for the upcoming round. 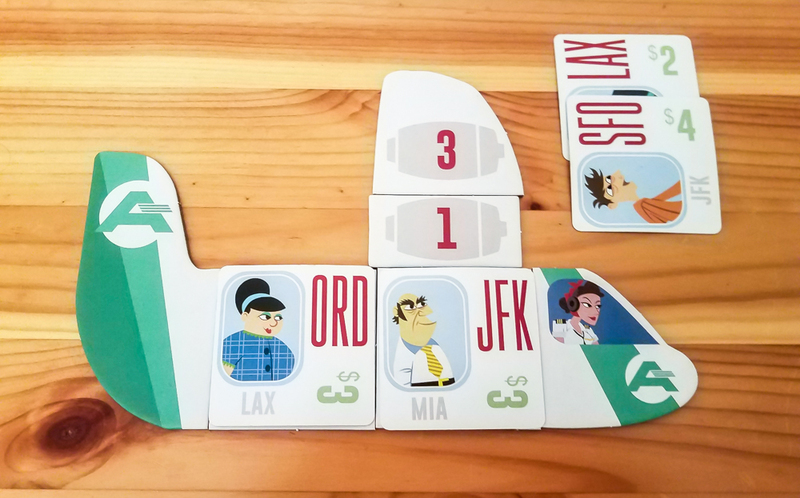 Each player’s plane has a cockpit, seats, speed tiles, and route tiles. The amount of seats you have tells you how many passengers you can carry; the combined speed number tells you how far you can move each round; and the route symbols tell you which special routes you can take. 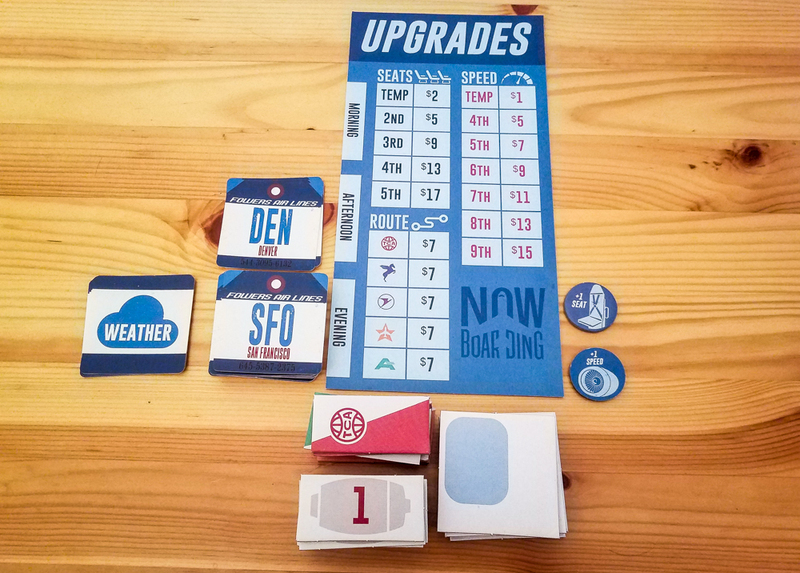 Each plane starts with one seat, 3 speed, and one route, and you get a chance to add one upgrade to your plane at the beginning of the game. Once the timer has been flipped, all of the players take their actions simultaneously. There are three types of actions you can take: move, pick up passengers, and drop off passengers. When you drop a passenger off at their destination, you’ll receive the reward shown on their card. For example, taking someone from San Francisco to Denver will get you $2, while taking someone from New York to Los Angeles will get you $5. Once the timer runs out, everyone can complete the actions they’re taking and then you move on to the Maintenance phase. During the Maintenance phase, every passenger card that is at an airport will get one anger cube. If they would be getting their fourth cube, they are taken off of the board and go into the complaint pile. The Maintenance phase is also when you’re able to upgrade your plane. You can buy permanent speed upgrades, seat upgrades, or new special routes. There are also one-time-use speed and seat upgrade tokens that you can buy, but there’s only one of each so other players have to wait for them to become available again before they can buy them. Once you’ve gone through all of the passenger cards during the Evening phase, you’ll play out one more round without adding any new passenger cards to the board. This is your last chance to get people to their destinations. Once you’ve completed that final round, you’ll add one passenger card to the complaint pile for every two passengers that are still in the air or at an airport. You’ll win the game if there are less than three complaints in the complaint pile. You’ll lose if you ever get three complaints. There are also VIP cards in the Now Boarding box that allow you to ramp up the difficulty a bit. These cards are attached to passengers and make them a bit tougher to satisfy. Planning your routes with your teammates is a lot more fun than I expected it to be. You would think you’d be spending most of your time performing the actions, but really about half of the game is spent trying to figure out how to get as many passengers to their destinations as possible. You learn really quickly that you need to work with your fellow pilots to get all of those passengers taken care of or else you’re going to be in a lot of trouble. I knew this would be a great board game theme, but I’m surprised how well it works as a cooperative board game theme. Half of the time you feel like pilots picking up and dropping off passengers, and the other half you feel like you’re air traffic controllers talking to each other and your pilots. That extra bit of randomness that the weather tokens give the game is really cool. They add to the theme and they give you something else to talk about before each round begins. It seems like everyone loves watching the planes develop in this game. At first you just have this small or slow plane, but all of those upgrades you get make you proud of what you’ve accomplished throughout the game. I’m a huge fan of this retro art style from Ryan Goldsberry. It looks great in Burgle Bros. and other past Tim Fowers games, and it works just as well here. Even without the VIPs, Now Boarding is super tough, but in the best of ways. Losses really haven’t been frustrating for my group; we just want to start a new game right away and try to do better. The rulebook is excellent. I really like that the key components are broken down on the first few pages and then it moves on to the setup and rules. It made learning to play the game very easy. Other than having different starting locations and their own starting special routes, there’s nothing that differentiates the five pilots. Just one minor special ability for each one would have been great. The small passenger cards were necessary for this game since they have to fit around the board and on the seat tokens, but they sure are tough to shuffle. The character art on the passenger cards is great, but I wish there were more characters. There are 72 cards in the deck but only nine characters (one for each destination city). I get that they did this to make it easier to recognize where the passengers are going, but giving them all different faces would have helped to make players feel like they were flying different people around the country. The 30-second sand timer used in four and five-player games doesn’t have as much of an impact as the 15-second timer does in the two and three-player games. It’s pretty rare that someone needs more than 25 seconds to complete their turn. Now Boarding is a very smooth-playing cooperative game that offers a great challenge and a theme that most people will be into. I think it’s the first real-time pick-up and deliver game I’ve played, and those two mechanisms make sense and work well with this theme. I personally think Now Boarding is best at three players, though it does work well at the other player counts. I just like the 15-second timer more than the 30-second timer because it puts more pressure on the players. Plus, you have fewer hands moving around the board at three players than you do at the higher player counts. 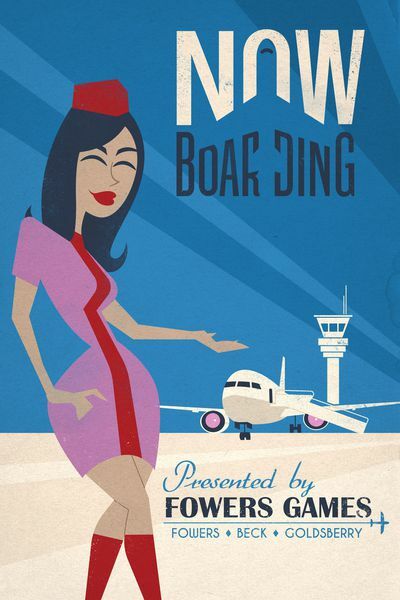 Though I think plenty of people will enjoy Now Boarding, I think I might like it a bit more than most because I feel like I’m an air traffic controller while I’m playing. I’ve always been very interested in that profession, so it’s great having this type of game in my collection now. If you like the idea of frantically flying people around the country and having long conversations with your teammates about how you can help each other achieve a common goal, you should get Now Boarding. UPDATE: Now Boarding made it onto our Best Cooperative Board Games of 2018 list! Thanks for taking the time to read our Now Boarding review! To stay updated on all things cooperative board games, follow us on Twitter, Facebook, or via RSS.